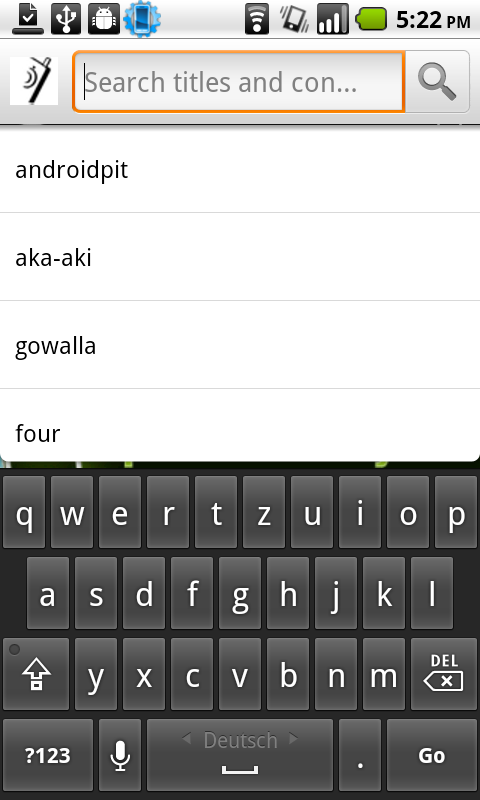 Today, I released MobileKnox 1.4.2 which contains minor bugfixes: Some typos in the German localization are fixed. Additionally, some minor glitches while changing the orientation are squashed out. Finally, in some circumstances the premium key was not correctly detected. This is also fixed. The next version of MobileKnox will contain some interesting features. So, stay tuned. Today, I released MobileKnox 1.4.0. This release contains one big new feature: “Used nearby”. “Used nearby” lists the entries that have been opened in the past close to your current location. For instance, if you are using entries (e.g., accounts for servers) mainly while being in the office these entries are listed. If you are using other accounts while being at home (e.g., accounts for flickr, amazon, and paypal) the entries representing these accounts are shown first in the list of all entries. 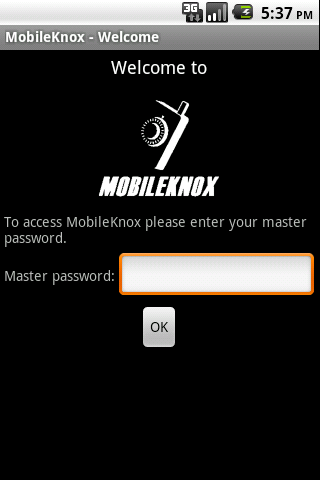 So, this makes accessing entries of MobileKnox really easy. The following screenshot shows a list of entries that is sorted by the distance between where I opened the entries the last time and where I am standing while holding the smart-phone. As you can see this really helps finding entries. We released a bugfix version of Mobileknox after customers told us that synchronization does not properly work with Android 2.1. 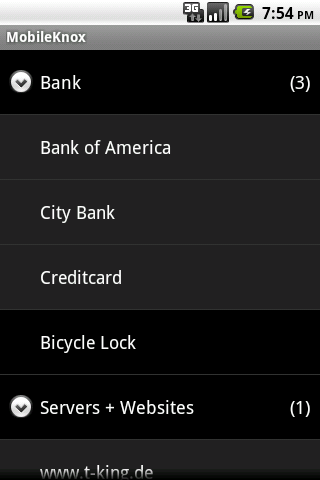 Tonight we released MobileKnox for Android 1.3.0. We added one main feature: Copy text from entries while showing them. It works like this: Select the entry you want to see (in this case the entry with title MobileKnox containing the credentials for the developer website). After clicking on the content field for some time the context menu opens and contains all the data that can be copied (in our case this is the login name, the password, and the URL). By clicking on one of these items the text is copied to the clipboard so that it can be used to be entered into another application (e.g., web browser to login). Please feel free to suggest additional features you think might be useful. A friend of mine just mailed me this comcic. It just tells the truth. Most people today use only a single password for all of their accounts. It is easy for an attacker to exploit this. To avoid all this: Use MobileKnox and DesktopKnox. All your different passwords can be easily managed by these tools. Just start using them and your accounts will never be hijacked just because an attacker learned only one password from you. 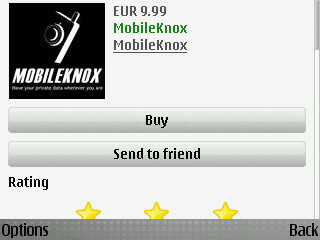 MobileKnox is available with German texts and icons in the Android Market. Have fun using it. 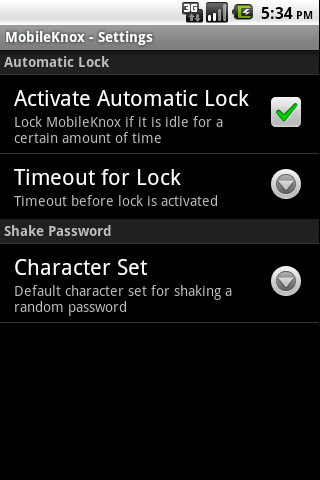 I am proud to announce the release of MobileKnox for Android version 1.1.5. This release contains two major new features: Firstly, searching entries by title and content. Secondly, the default installation location of MobileKnox is set to be the SD card (if available). This saves storage on the internal memory of the phone which is typically scarce. More features will come soon. Stay tuned. Safe is around for more than 6 years now. Back in 2001 I started working on Safe during my summer semester break. My intention was to play around with Java 2 Micro Edition (J2ME) and to solve the problem of remembering so many different passwords and logins. It started pretty basic but over the years Safe improved much and a few month ago a desktop application called SafeDesktop joined Safe. These two applications are a mature solution to organize and store sensitive data (such as passwords and logins) in an encrypted way. To keep the data between the desktop and the mobile device up-to-date a easy to use synchronization mechanism is provided. In 2007, Safe is downloaded from the project website more than 17900 times. Since its appearance in May 2007, the download counter for SafeDesktop shows currently a value around 2500. On average, I get at least one email every week regarding Safe or SafeDesktop. The forum is also used quite frequently by users to discuss different topics around Safe and SafeDesktop. Additionally, there is a small community of people which write about Safe and SafeDesktop in their blogs and forums. As far as I know at least four comprehensive user reviews have been published and an unknown number of posts mentioned Safe or SafeDesktop. Although, the source code is freely available under GPL, I only received a patch once. And by that time the problem has already been solved by myself. Frankly, I am a bit disappointed that it is so hard to find developers that are willing to contribute to the project. This means, all the development work has been carried out by myself. This is one of the main reasons why I decided to fork Safe and SafeDesktop into pay software. During the last weeks two friends of mine and I worked pretty hard to get Safe and SafeDesktop ready for sale. 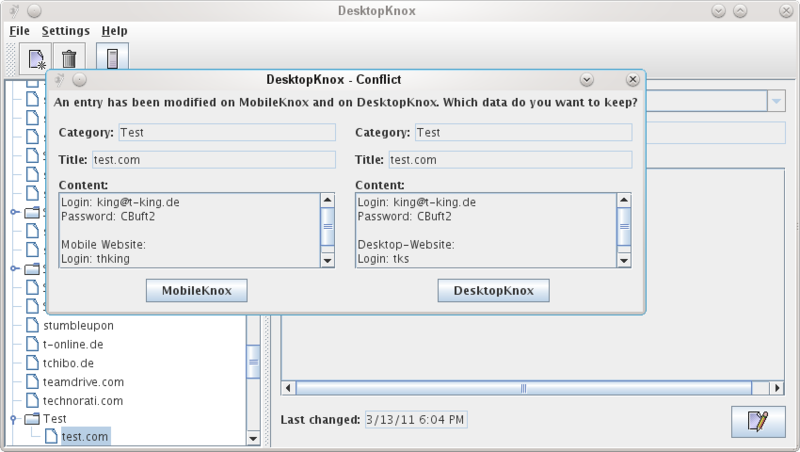 First, we renamed Safe to MobileKnox and SafeDesktop to DesktopKnox. Second, I added a bunch of new features. The security algorithms used by MobileKnox and DesktopKnox were overhauled. Now, both applications use the well-known AES encryption standard with a key length of 256 Bit for encryption. SHA256 and SHA512 are used for one-way hashes. Furthermore, the import and export functionality of both applications are improved. 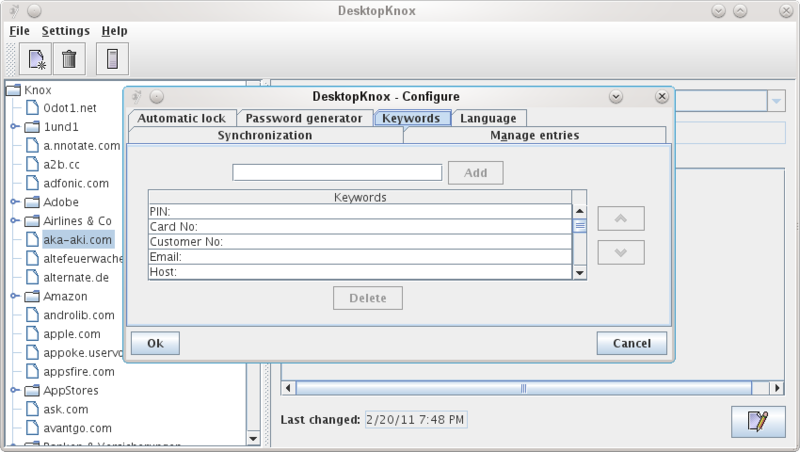 An IP address finder tool is added to DesktopKnox. For this, I used JSTUN, another project I am working on. MobileKnox contains now a version checker to make it easy for users to stick with the latest version. Third, we set up a fancy website to promote the applications and to support users. For the near future, we plan features like categories and synchronization over Bluetooth. However, the appearance of new features depends on the number of buyers we will have in the next few weeks. 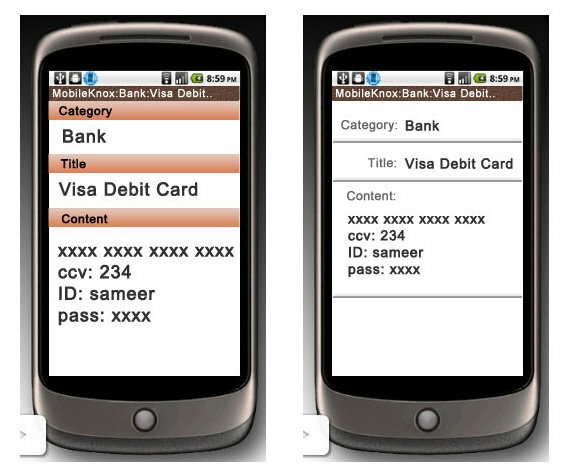 We provide a trail version of MobileKnox that is able to store three entries. To store unlimited numbers of entries a personalized serial key must be purchased. The price tag for such a key is 9.50Eur. 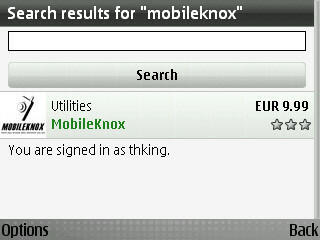 It can be obtained from the website: http://www.mobileknox.com. In case you are a possible user of the pay-version of Safe and SafeDesktop, do you have any feature requests? Please let me know. I will give away a pay-version of Safe and SafeDesktop for free to each person that requests a feature that will make it into the final version. So far, we have not decided what the price-tag for Safe and SafeDesktop will be. Currently, we think about a price range of 5-10 Euros. This includes all minor updates (lets say you pay for version 2.1 of Safedesktop, this means all versions until 3.0 are covered by your license) and email support in case of questions. The official release date of the pay-version of Safe and SafeDesktop will be soon but has not been set yet. Today, Safe and SafeDesktop got reviewed on Motorolafans.com. Kiwiguy, this is the nickname of the author, first described how to install Safe and SafeDesktop. Second, he discusses two methods to synchronize the data stored inside Safe and SafeDesktop. The first approach he describes is the one I have envisioned: Using the Internet to easily connect your mobile device to your desktop machine. Unfortunately, this did not work out for Kiwiguy. I am going to get in contact with him to solve this problem because for many users (including me) synchronization over the Internet works pretty well. The second method Kiwiguy is describing is pretty clever: Manually copy the data from the mobile device to the desktop machine. This allows at least a one way synchronization and is better than nothing. I never thought about this way of doing synchronization but I like it. This also allows users with no Internet access at their mobile device to easily synchronize their data. To further facilitate this approach, I am going to enhance SafeDesktop so that it can import encrypted data. Further, Kiwiguy posted a message to the Safe and SafeDesktop forum. In this posting he is complaining about getting confused with the "ok" button and the "change password" button directly after Safe is started. I already thought about moving the "change password" button to another place and this comment is the impulse to really do it. So, the next version of Safe will only show a "ok" button after you entered your root password. Thanks Kiwiguy for your review and your comments about Safe and SafeDesktop! I really appreciate any comments about the tools and I just love to hear if someone is using the tools for his or her daily life! Just a brief update: I released Safe 2.2.6 and SafeDesktop 0.9.2 a few days ago. Everybody using earlier versions of these tools should visit www.javawi.de and get an update. By the end of last year I bought a Nokia E70. Until then, I used a Siemens mobile phone to make my calls and a Palm Tungsten to organize my life. The E70 is a so-called smart-phone, what means that it combines the features offered by a Palm pilot and a common cell phone. So, the E70 is supposed to replace my old Siemens mobile phone and my Palm Tungsten. As most of you already know, I developed a J2ME midlet to organize my accounts and other sensitive data a few years ago. This midlet is called "Safe" and it stores all data encrypted. A master password is required to get access to the data. This allows me to chose another password for each account and never forget this information. Especially, the growing number of websites that require an account make this tool very handy. However, when I started developing "Safe" back in 2001, J2ME was not supporting any file system access. This recently changed and so I started implementing an import and export for "Safe". After a few hours of development, I accomplished the job. 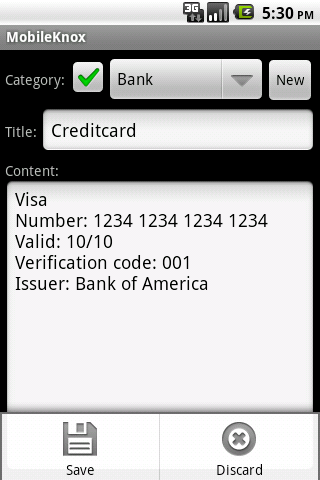 I utilized this new feature to copy all my data from the Palm to the E70. Special thanks to the Kxml guys for their great J2ME xml parser and generator.